Do you crave sweet foods or do you crave salty foods? I used to be someone who needed a sweet treat in the afternoon, but over the years I’ve started to lean more toward the salty side. What’s nice about sweet potato fries is that they’re a bit sweet and salty – the best of both worlds, in terms of crave-ability! Plus, they’re healthy, especially when they’re baked in the oven vs. fried. 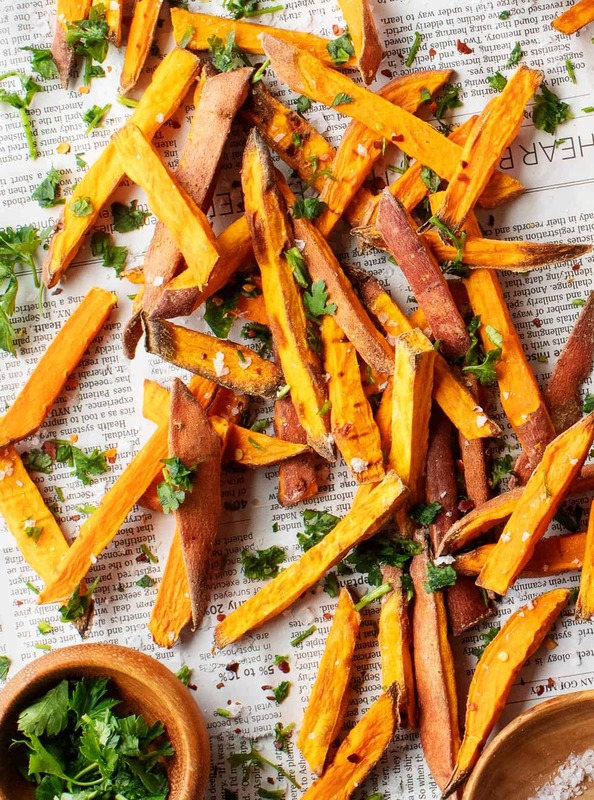 Because we love sweet potato fries so much, we recently went back to the drawing board testing out all kinds of variations to find out how to get a perfectly baked sweet potato fry. It was rigorous and delicious job… suffice it to say that I’m not going to be vitamin A deficient any time soon. Here are our findings! 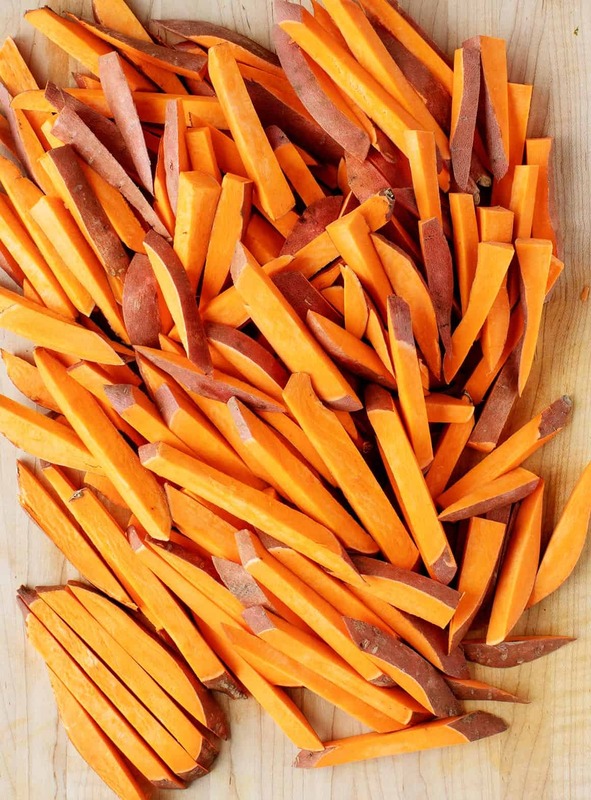 Soak your sweet potato matchsticks in cold water before putting them in the oven. I soaked mine for 30 minutes, but you can soak them longer if you have the time. Once soaked, make sure you dry your fries thoroughly before tossing them with oil. Toss them in cornstarch. This helps them become just a bit more crispy than baking them without cornstarch. Don’t salt until the fries are baked. Of all these tips, I found that waiting on the salt made the smallest difference in the final texture, but if you want truly crispy fries, sprinkle them with salt once they’re out of the oven. Don’t peel your potatoes! Their skins are nutritious and help create crispy fries. If you have a convection setting on your oven, now’s the time to use it. Convection ovens circulate air constantly, promoting quick, even baking that will get your fries lightly browned & crisp. Slice your sweet potatoes into matchsticks ¼-inch thick. Try to cut your fries to a uniform size so that they bake evenly. Soak them in cold water for 30 minutes or more. Once your fries have soaked, transfer them to a kitchen towel and pat them dry. Toss them with olive oil & cornstarch. Hold the salt! Place your fries on a metal rack on a baking sheet with space in between each one. If they’re too crowded, they won’t crisp up in the oven. Bake in a 450-degree oven for 30 to 38 minutes, or until nicely browned & crisp, but not burnt. Sprinkle generously with salt and let them cool slightly. Enjoy immediately! Sweet potato fries are best eaten right after they’re baked, but if you have leftovers, they’d be great stuffed into tacos or chopped up and topped onto on avocado toast. Sprinkle them with fresh herbs like finely chopped cilantro and/or parsley. Toss them with spices after baking. Chili powder, shawarma spice, smoked paprika, or a sweet/spicy combo of cinnamon & cayenne would all be delicious. Dress your fries in a cozy combination of minced rosemary and a little garlic powder. Don’t forget to dip! Chipotle sauce is my dip of choice here, but I love sriracha mayo, ketchup, and mustard, too. Portobello Pups – my take on a veggie dog! And if you love these fries, I urge you to step out of your fry comfort zone and make these crispy baked parsnip fries next! Preheat the oven to 450°F and place metal racks inside 2 rimmed baking sheets. This allows the oven’s hot air to reach all sides of the fries so that you don’t have to flip them halfway through baking. If you don’t have metal racks, you can use parchment-lined baking sheets. Soak the sweet potatoes in a large bowl of cold water 30 minutes. Drain, then pat dry. Spread the potatoes onto an even layer on the baking racks/sheets so that there’s room between each fry. Bake for 30 to 38 minutes or until browned and crisp but not burnt. If you aren’t using the metal racks, flip the potatoes halfway through. Remove from the oven and season generously with sea salt. Toss with fresh herbs, red pepper flakes, and serve with ketchup, mustard, or chipotle mayo, as desired.